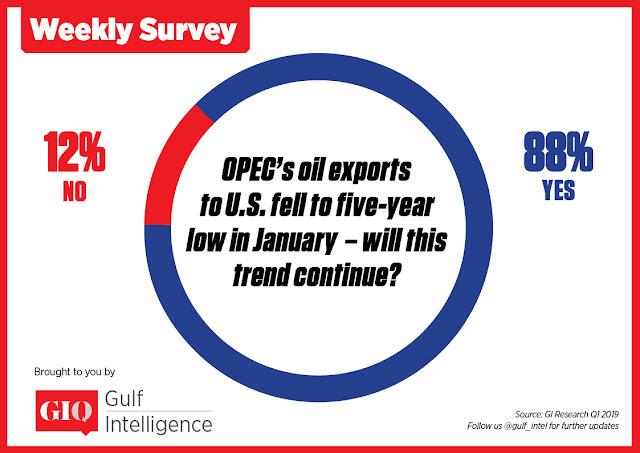 Riyadh, March 31, 2019 (Gulf Intelligence) – OPEC exports to the US are likely to continue trending downwards, according to the majority (88%) of energy executives polled in a Gulf Intelligence GIQ survey, ahead of the inaugural Gulf Intelligence Saudi Arabia Energy Forum in Riyadh on April 8th. OPEC crude exports to the US fell to a 5-year low in January while US stockpiles climbed to 3.6 million barrels in February, according to the US Energy Information Administration (EIA). US production has increased a staggering 140% since 2008. Some analysts forecast that the country could be a net exporter of crude and refined products by as soon as 2020. US output hit 12 million b/d in February, contrary to previous expectations that this level would not be reached until the second half of the year. Saudi Arabia, the largest oil producer within OPEC, has seen it's crude exports to the US drop steadily over recent years, from 1.361 million b/d in 2012 to 949,000 b/d by 2017 and to about 500,000 b/d by the end of last year. The US has in fact been importing less crude oil altogether—not just less OPEC crude – from 262.8 million b/d per month at the start of 2017 to 226.6 million in October 2018—the last month for which there is data, according to the EIA. Despite the loss of US market share, however, OPEC and its coalition of non-OPEC producers, including Russia, have continued with their strong commitment to comply to the output cut deal agreed to in December - namely to trim production collectively by 1.2 million b/d through to at least June 2019. The agreement by the group of 25 producers, known as OPEC +, follows two years of cuts of 1.8 million b/d, which succeeded in reversing a 3-year oil price slide and restored a certain amount of stability to the market. The strategy has continued to work, with Brent prices holding comfortably in the US$ 60s/bbl range since the start of this year. On March 29, 2019, Brent closed at US$ 68.39/ bbl. Compliance by the OPEC + coalition in February was almost 90%, up from 83% in January, according to the Joint Ministerial Monitoring Committee (JMMC). The JMMC convenes bimonthly to assess the impact production cuts are having on the market. At its last meeting in Baku on March 18th, it decided not to proceed with a full Ministerial Meeting that had been planned for April as market conditions were deemed stable. “The job of OPEC and its allies is not done yet and the group of oil producers need to stay on course at least until June when the current global cut agreement is due to expire,” H.E. Khalid Al Falih, Minister of Energy, Industry and Mineral Resources, Saudi Arabia said in Baku last month. The JMMC next meets in May ahead of the OPEC Conference meeting on 25 June in Vienna, during which a decision is expected to be taken on production targets for the second half of 2019. Additional oil price support has come from US sanctions on Iran and Venezuela, two major OPEC producers who are currently exempt from the output cut deal. US restrictions on the Venezuelan energy industry have crippled the country’s oil exports, which dropped 40% in the first full month after sanctions were initiated in early February, removing 330,000 b/d of supply from the global market, according to Goldman Sachs. Iran’s exports meanwhile have hovered above 1 million b/d so far this year, having dropped in the past year from a level of 2.5 million in April 2018, a month before the U.S. decided to re-impose sanctions. The Gulf Intelligence Saudi Arabia Energy Forum, under the patronage of His Excellency Al Falih, takes place at the King Abdullah Petroleum Studies and Research Center (KAPSARC), Riyadh, on April 8th and will gather industry leaders to deliberate the theme of Digital Transformation in the Energy Industry.